Three big coupes ... 3 V8 engines ... three long distance tourers. We line them up and go driving to find out how they shake up. 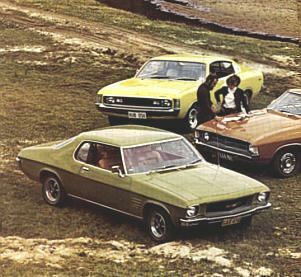 Since it was Ford who kicked off the two-door hardtop bit in Australia (back in 1965 with the XM Falcon - quite unsuccessfully as it turned out) it's ironical that Ford's coupe is the last of the Big Three to arrive in earnest. Anyway, it's here now, and with a performance image already created and waiting for it by successive Falcon GTs and HOs and by the concept's acceptance guaranteed by the legwork done by the Monaro and Charger. About the time Ford was releasing the Hardtop, Chrysler very, very quietly nudged a new V8 Charger out into the daylight - a thing called the E55. It is a sort of super luxury Charger with a trim rating a little above the 770. A thumping new 340 CID V8, the Torqueflite automatic transmission and the R/T E49 7-inch mag wheels. The idea was to make the car a strong, smooth and quite touring car. Since the big Falcon V8s have long been lauded for their touring abilities, we decided to line one of the new hardtops up alongside this new Charger, and a Monaro 350, and head for the open road. For the first time, it was possible to evaluate the Big Three's big power tourers with the same type of body, instead of two being coupes and the other being a sedan. Because of the Charger's emphasis on comfort, we took a Falcon Fairmont 351 2V rather that a GT. Technically speaking, we should then have gone for a Monaro LS. But the LS' soft-suspension bit is taken too far into the slushy realm, not allowing it to get near even the luxury versions of the other two which retain a better ride/handling compromise. So a GTS it had to be. There are, of course, great similarities between the three cars. They're built on similar dimension for similar markets and with similar power trains. All have good workable styling - and all have very little rear room, and huge boots. Taking the cars individually, you soon find that the Charger is the best compromise between luxury and sportiness of the three. Since the base Charger has a very good ride and the best handling of the basic Big Three cars, the E55 was off to a good start. For the E55 (or "SE" as it's known in the showroom) the engineers went for a road behaviour compromise in the spring and damper rating that gave a good ride but left the balance still slightly in favour of handling. 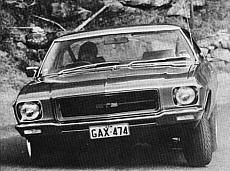 Thus the SE doesn't feel as far removed from the R/T as the Fairmont does from the Falcon GT. The importing of the hefty Chrysler 340 V8 is a surprise because Adelaide had been going all out for its six-cylinder power image. There is more to it all than meets the eye, too - the car we borrowed had been registered in January, 1972, and yet wasn't released until September. Link this with the fact that the 340 is a real mover that's been used with great performance success in the US and you get a pretty fair idea that Chrysler looked hard at using the V8 and not the E49 six for its competition car this year. In the SE, the 340 is in fact detuned from its normal state - its usual cam has been replaced by the milder one from the familiar 318 V8 and it has a restricting exhaust system. This cuts its bhp back to a rather tame 275 at 5000 rpm, although the strong 340 lb/ft of torque at 3200 rpm is not affected. Obviously, this engine has fine low-down power and smoothness and is best mate to an automatic. In fact, you can't buy it with a manual transmission. 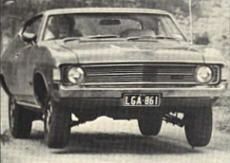 This meant that we used an automatic Fairmont and Monaro for the test, too. How sweet the SE engine is - its gets up and goes, lugging the car off the line with real oomph, but yet it stays rocket smooth and quiet, making the acceleration seem deceptively slow. Our performance comparison show how terrifically strong low-down the engine is, and how efficiently it teams with the automatic - performance is extracted so efficiently in Drive that changing up manually yourself knocks only a mere tenth of a second off the quarter mile. By contrast, the Monaro is seven tenths faster when the shift is worked manually. Pressing the throttle hard down to say 70 mph brings a solid thump in the back. You can really feel that lorry-load of torque - even the 10 CID bigger Monaro and Falcon feel tame by comparison. The Charger has a real glued-to-the-road feeling, no doubt created by the wide track and wide, wide boots. It gives the impression of being a very stout, heavy car - except that the steering is so light you can easily mistake it for a very good power-assisted set-up. With this, its neutral, excellent handling and powerful roadholding it is immediately a very fast car that allows quick, effortless touring. However, when exploring the limits it can become a handful with with the driver having to toss it about and work hard to hold it. In this area it perhaps doesn't have the final delicate balance of the Falcon. 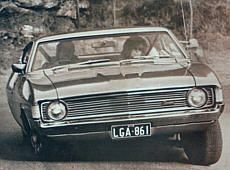 Ride, like the rest of the car, feels more solid that the Falcon and perhaps a little more abrupt that the Monaro GTS, but for motorists who consistently enjoy their driving the compromise is the best. We prefer the Charger's driving position, too. The seat has been raised in the E55 (and E49), giving better wheel control and vision. Comfort is excellent, though there could still be more lateral support - those inertia reel belts don't help much. Where the Charger does top the other two coupes (and this applies to all models of the three) is in rear seat comfort. Two adults can travel quite happily there because even though the legroom is less than the Monaro's, the headroom is much better and so is the seat shaping. As in the other two cars, the brakes can be made to fade, and the right rear wheel on the test car usually locked up in hard stops or for braking into a bend, flicking the tail out. Fuel consumption worked out to a steady 12.9 mpg. 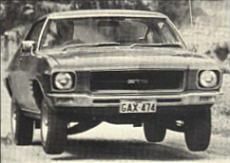 There is an unmistakable impression about the Monaro - and indeed, all the HQ Holdens - that they're engineered to go along the road in spite of the driver. By this we mean the accent has been on built-in understeer and emphasis on roadholding, rather than handling. Thus the Monaro isn't really a car for drivers. Don't misunderstand - it's competent, safe, rides particularly well (especially on the dirt) and can maintain a steady high speed. This engineering theory might be good for disinterested, lazy drivers, but for someone who cares and knows what driving is all about and is trying to stay with the Falcon and Charger it becomes a liability. Simply, the Holden has so much terminal understeer built-in that after a certain point it totally inhibits progress. Where the other two cars, especially the Ford, can be carefully set-up and driven accurately on the throttle, the Monaro can't. This shows up on dirt - in the quest for fast times the Charger and Falcon can be set-up with the tail out by left foot braking to eliminate understeer completely. By the same token, if the Monaro's tail does get out (something GM has deliberately tried to stop, bless its heart) as it will in the middle or coming out of a bend it is very easy to hold and catch. The car we drove this time was on Olympic Reflex radials and they improved it 100 percent over the one shod with those abominable D70H14 that we tested in July issue. This one had none of that sharp steering wheel kick every time the front wheels hit a bump, and the car was much more stable on the road. Grip in the wet was easily the best of the three cars (the Charger wore Goodyear Grand Rallies and the Falcon had Dunlop Aquajets). We've said it before just how good the GM 350 engine is - and we say it again. We prefer it to both the Chrysler and Ford V8s because it has a superb blend of smoothness, low-down oomph, consistently flat pull right through the rev range and excellent top-end performance. Though the auto box shifts like lightning and is super-smooth, you do need to hold second out manually to get the ultimate performance. The penalty for these virtues is thirst though - like 10.7 mpg. The area that really kills the Monaro against the other two is driving position and comfort. The wheel is too close, the minor controls too far away, the brake much too far above the throttle and the seats just plain bloody awful. They're too flat, recline by too great a jump and have absolutely no lateral support. The rear space (which is excellent compared with the Falcon) is spoiled by simply poor seat design, and to some degree lack of headroom. However, this is a well-built, almost quality feel to the Monaro, that the others don't have. It feels strong and reliable, if a little cold and characterless. After the SE and GTS, the Fairmont felt very loose and sloppy. 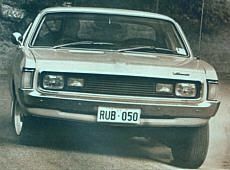 There were two simply reasons - it had power steering and its suspension was set much softer than the Charger or Monaro. Coupled with lack of feel, the quickness of the variable ratio power made the car seem delicate and twitchy and gave the impression that roadhandling was inferior to the others. But it was simply a matter of letting the car introduce itself. Then, we discovered that it really did have very good roadholding and excellently responsive handling. The Falcon doesn't have the solid, stuck-down feeling of the Charger. The car can be flung about beautifully, to such a degree that it is faster in the dirt (the softer springs prevent the axle hop that eventually stalemates the Charger). Striving for that last little bit, we felt it was easier to get the most out of the Ford than the Valiant. Its greater delicacy, sensitivity and responsiveness was the reason. There's little between the Hardtop and Charger for driver comfort. While the Falcon is more tasteful, more plush-looking and cosseting, the Charger is more sporting and locates the driver better for vision and easy placement of the car. The Falcon fails totally in rear seat accommodation. Both the headroom and legroom are terrible, and we wouldn't be happy to travel there for more than a few miles at a time. Stupid in a car the Falcon's size. 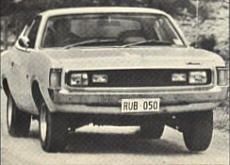 Three-quarter rear vision is also poor, particularly compared with the airy Monaro. The Falcon is very quiet though, adding to its, relaxed, comfortable touring abilities. As the figures show, the 351 2V is much slower than the others, with their four-barrel carbies, feeling quite gutless by comparison. Apart from power it's not as nice an engine as either the Holden or Chrysler unit either, lacking their total smoothness. Naturally fuel consumption is less though. We clocked 13.9 flat out. As touring cars, the Monaro is out of the running with the other two, mainly because of its seats and to a lesser degree its undying understeer. What a pity since it has the finest body and best power unit along with good roadholding and that well-made feeling. Personal taste will then take over between the Ford and Valiant. The Falcon is the easier, more pleasant car to meander along in (though it needs the power assistance to keep steering so effortless and match the Charger's lightness), mainly because of the softer ride. When asked though it will respond to very, very fast driving with truly superb manners. The Charger is perhaps the better compromise between sportiness and luxury - more of a cross between the Fairmont and Falcon GT. And since it has quite good rear comfort it is easily the most practical.